Digitech’s DOD Rubberneck analogue delay has just been shown at NAMM 2017 and it looks a lot like a ’boutique’ style pedal, and looks to be aimed at the tone connoisseur crowd. 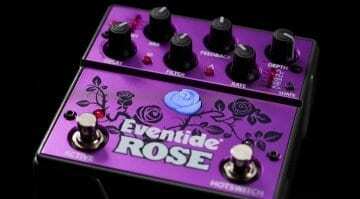 To me, it looks like Digitech want a slice of the boutique delay pedal market. 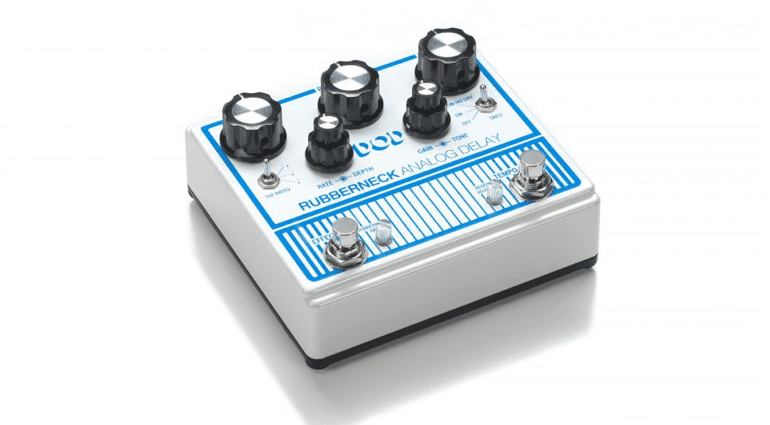 The Rubberneck has up to 1.5 seconds of delay time and they state throughout all the blurb that it is 100% analogue throughout. The layout is very clean and DOD has even been good enough to provide a detailed explanation of all the controls for you to read. 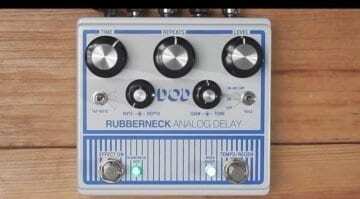 Rubbernecking refers to the ‘rubber band’ stretched delay effect that this delay can produce when tweaked. The delay has a tap-tempo facility and has controls for both modulation speed and depth, via the Rate/Depth control knob on the left. The Rubberneck has a useful Loop Send/Return inserts effects feature which allows you to place other pedals into the pedal’s delay path. 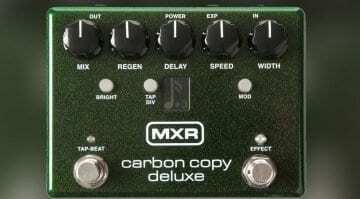 This means you can kick in two effects at once, essentially, so if you want to have your phaser come on with your delay, then this makes life so much easier. You can choose to have delay tails carry on after the effect has been disengaged or have them cut out straight away via the Tails switch on the right side of the Rubberneck. Again, a handy function. You can remote control the Rubberneck using the external footswitch jack on the rear as well, this works with the optional FS3X 3-button remote foot switch. 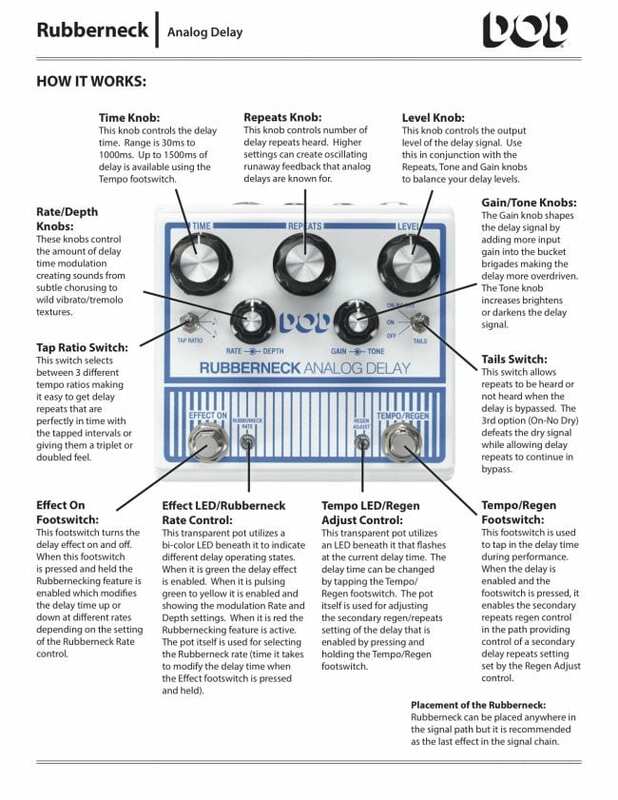 DOD has put plenty of useful features into this pedal. This is possibly one to look out for if you like analogue delays, but require some more modern features that vintage delay pedals just don’t have. 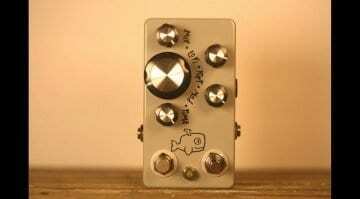 I’m looking forward to hearing some better audio demos of this pedal and will update as soon as some become available. For now, check out the Reverb.com video below which features a brief section on the pedal.